Scale modes are played by starting the Major Scale on a different note. Ionian Mode - Played the same as the Major Scale, starting on the first note. Dorian Mode - Played by starting on the second note of a Major Scale. Phrygian Mode - Played by starting on the third note of a Major Scale. Lydian Mode - Played by starting on the fourth note of a Major Scale. Mixolydian Mode - Played by starting on the fifth note of a Major Scale. 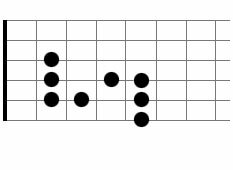 Locrian Mode - Played by starting on the seventh note of a Major Scale. Example: the A Dorian Mode is played by starting on the second note of the G Major Scale. 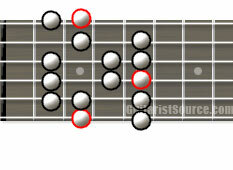 Using the notes of the G Major Scale (below on left), and starting on A or second note, and using the same notes from the G Major Scale, the Dorian Mode is formed (below on right), in this case A Dorian (A, B, C, D, E, F#, G).